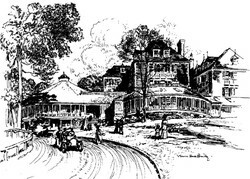 Forged out of the Ramapo Mountains on the shores of Tuxedo Lake in 1886 by the wealthy tobacco heir Pierre Lorillard IV, Tuxedo Park was built as a resort haven and sportsman's paradise for society of the Gilded Age. It was the birthplace of the tuxedo jacket, and its Autumn Ball launched the social and marital careers of generations of socialites. In its bucolic landscape, renowned architects built homes in historical European styles for the Astors, Morgans, and Vanderbilts. A man of many talents, Pierre Lorillard also managed a successful tobacco company; raced horses and sailing yachts; and funded archaeological expeditions in South America. The story of this fascinating man will be presented by George Langberg, historian of the Town of Tuxedo. Available on the day of the luncheon will be the award-winning trilogy of full-color, illustrated books covering Tuxedo Park's architecture, history, and landscape by Chiu Yin Hempel. The Tuxedo Club will be open at 11:30 for guest to enjoy the patio. Lunch will be served at 12 noon. For additional information, contact Kay Yeomans of the Upper Saddle River Historical Society at kayyeomans@optonline.net or (201) 327-2236. Tickets are "will call"?only; your name will be on a list at the door. Directions will be emailed to you with your confirmed reservation.